Going along with P.A. 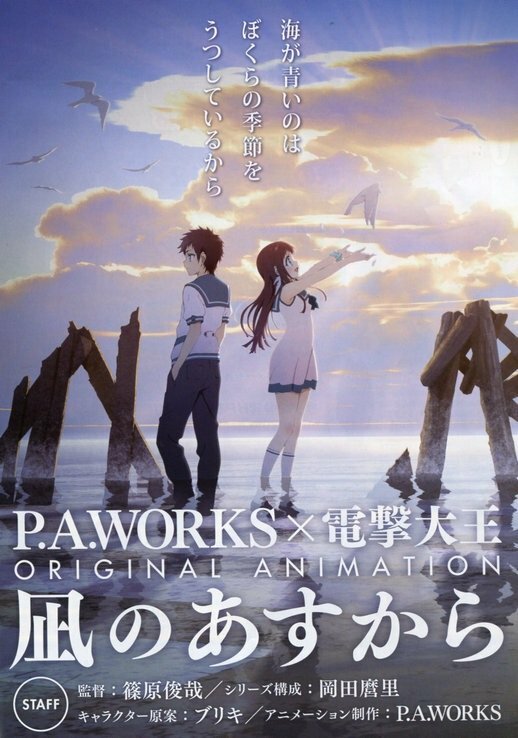 Works’s trend of quaint anime series such as the likes of Hanasaku Iroha and Tari Tari, we have their latest original work Nagi no Asukara. After just watching the first trailer for the anime, I think I’ve already fallen in love with the gorgeous setting. The story seems to take place in a quiet town, but there’s a catch (almost quite literally). The world appears to be submerged underwater, except it’s kind of not. I mean, there are fish swimming around in midair, yet people walk around like it’s normal, which it probably is. To makes matters even stranger, there’s an actual ocean bordering this seemingly Atlantean town. The sort of run-down aesthetic of the town intrigues, as does the use of what appears to be magic. I’m very curious as to what kind of story this turns out to be. Working on the project, we have Toshiya Shinohara (Black Butler) as director, Mari Okada (Ano Hana) as script supervisor, and Bukiri (Boku wa Tomodachi ga Sukunai) as the character designer. Leading the cast are Kana Hanazawa (presumably no introduction needed), and Natsuki Hanae (“Wien” from Tari Tari). The fall anime season is shaping up to be pretty good.